When you take on the challenge of building your own car, street rod, hot rod, rat rod, or performing your own automobile repairs, the more skills you have, everything becomes simpler. This is true when working on a house, technology, or anything else. One of the draw backs if you want to call it that would be the time element. The more you can do yourself, the project, whatever it might be, takes longer to complete. The advantage when doing work yourself, there is sense of satisfaction and pride, not to mention a financial saving. The financial saving is increasingly becoming a large factor when you look at how everyday living expenses are growing. Just one simple thing, the cost of fuel, both gas and diesel fuel have increased substantially in the last 3 to 4 months. The increased cost of getting back and forth to work is diverting money for recreation, hobbies, leisure, and all those other non-essential items. Growing up without much money and having a father with many skills, I learnt how to do a lot. This sometimes is a bit of a curse, as everything takes just a bit longer to complete. As I see it, if you are intending to build a hot rod, why not learn how to do as much on the car as possible. Now it’s time for me to install the brake lines on the 1929 Model A Ford roadster hot rod. There was a few ways I could tackle this job. I did have a new coil of 3/16” (0.1875”) steel brake tubing but I needed to purchase all of the fittings and straighten the brake line, not mention I would need to make the ISO metric bubble flares. Another option was to purchase straight pre-made lengths of brake lines with the correct fittings. This option seemed to make sense but none of the lines would be an exact fit on the 1929 Ford Roadster hot rod. Not wanting excessive amounts of brake lines on the frame or chassis, I decided that cutting them to the length I required and re-doing the flare was the best path for me. I am the sort of person that thrives on learning new things. This curiosity required me to learn how to make the ISO metric bubble flare. My 1929 Model A Ford roadster hot rod has C4 Corvette suspension removed from a wrecked 1986 Corvette Indy Pace car. The brake components from this vintage of Corvette use the ISO Metric bubble flare. A few years ago, I purchased a rather inexpensive double flaring tool kit. As with most things, especially with tools, you get what you pay for. This kit was okay for making a single flare, but inverted double flares would never come out perfectly no matter how careful I was. I found that there was too much play in many of the parts required to make the inverted double brake line flare. Oh well, I couldn’t be too disappointed as I only paid $25 for the kit. Now there is good in everything. I found this same kit would make a perfect ISO Metric bubble flare every time. ISO Metric bubble flare - An example of an in-expensive double flaring tool kit. Great for single flares and the ISO Metric bubble flare. This does not make a good double inverted flare. There is too much play in several of the components. Having the ability to make good ISO Metric bubble flares, I felt that purchasing pre-made brake lines longer then I required would be a compromise to this interesting hot rod task. This first step was to plan a layout for the brake lines and then approximate the lengths of all needed brake lines. Then I went off to see my friends at NAPA and purchased what I needed to completed the job. My intention is to shorten the lines I purchased from NAPA to the exact length required for the 1929 Ford roadster hot rod. In order to create perfectly shaped brake lines, I used 0.125 inch ( 1/8th”) wire and created the required shapes for all brake lines. These then became templates for the actual brake lines. Carefully measuring all of the templates, all brake lines were cut to size allowing an extra 0.25 inches ( ¼” inch) for the bubble flare. Once the tubing was cut, I used a soft wire wheel on the stationary grinder to de-burr the cut tubing. This is fast and produces a nicely finished cut tube. Of course you can also use the de-burring tool usually supplied with the flaring tool kit, but with the cheaper kit I purchased, I found that it did not work all that well. ISO Metric bubble flare - An example of a wire template for accurate brake line bending. A 0.125" or 1/8" wire was used to pre-shape the actual brake line. This is a real time saving tip. The next most important step is to install the brake line fittings with the correct orientation. Now mount the brake tubing into the flaring bar such that the freshly cut tubing is facing the flat side of the flaring bar and the flat side of the flaring bar is facing in an upward direction. For 0.1875 inch (3/16”) tubing leave about 0.25 inch (1/4”) exposed from the face of the flaring bar. ISO Metric bubble flare - Getting ready to make the ISO Metric bubble flare. The flat side of the flaring bar is facing upwards and about 0.25" or 1/4" of the 0.1875" or 3/16" tubing is exposed from the face of the flaring bar. The flaring bar needs to be firmly tightened to prevent any movement during the flaring process. For a quality flare, mount the flaring bar with the clamped tubing into a bench vice. This will prevent un-necessary movement during the flaring process and make the alignment of the flaring yoke and inverted flaring adapter button easier. ISO Metric bubble flare - Ready to make the flare. The flaring yoke and inverted flaring adapter are set up squarely onto the clamped brake tubing. Perfect alignment at this point in very important in order to make a perfect bubble flare. Once everything is lined up perfectly, tighten the flaring yoke onto the tubing. Do not over tighten the flaring yoke as excessive force will destroy the flare. It would be a good idea to make a few practice flares on some scrap tubing before making the bubble flares on brake lines that will be used on a car. With the flare complete, remove the flaring yoke, inverted flaring adapter button, and remove the tubing from the flaring bar. I have noticed that the flaring process does reduce the hole opening on the tubing and would restrict the flow of brake fluid to a minor extent. To optimized the brake line, I use a 0.125 inch (1/8”) drill bit to ream out the hole opening. The brake line will need to be clamped in a bench vice for this optional step. ISO Metric bubble flare - optional step - drill the opening carefully with a 0.125" or 1/8" drill bit to open up the flare. This will improve fluid flow once installed. ISO Metric bubble flare - The complete bubble flare as used on the 1929 Ford roadster hot rod. To make everything easier to visualize, I created a short video of making an ISO Metric bubble flare. Just click on the link below to watch the video. I am going to give this a try and use Facebook for 1929fordhotrod.com. Let’s see how this works out. Below is a like button that you can use if you like the information on this website or just visit my Facebook page. Here we are in the middle of April and guess what? It snowed this morning, leaving a nice white blanket of snow on the ground. Boy, Mother Nature is having a great bit of fun with us this spring. Hmmmmm, what happened to global warming? Oh well, we can’t do anything about the weather, but I will show you how a created some very nice and exact brake line bends. The 1929 Model A Ford Roadster hot rod is using C4 Corvette suspension and brakes. The parts all came from a 1986 Corvette Indy Pace car convertible that met with an unfortunate ending, rendering the car to the world of salvage. The good thing from this sad event is that every part that I did not want or need was sold, including a wrecked shell of the body. A tidy bit of profit from this venture was now on the table. That would be re-cycling in this day and age at its best. The 1986 Corvette uses the metric ISO bubble flare on its brake line tubes. Wanting brakes lines to look good on an open wheeled high boy roadster hot rod can be a bit of a challenge. Nice tubing bends and exact fitting lines are the fine bits of detail and do require patience and time. In another post, I will show you how to make perfect metric ISO bubble flares. Bending brake lines and fitting them on the car is a real craft. I found that the process can be simplified if I made a mock up of the brake line before bending the actual tubing. For this I using 0.125 inch ( 1/8th”) wire. This can be purchased from any farm supply or fencing store. I had the good fortune to have a roll of it left behind by the previous owner of the Victorian house I bought many years ago. This gauge of wire cuts and bends very easily. When you are underneath the car in tight areas, this is an important feature. Having several very complex bends to make, the mock up of the brake line became an invaluable tool for me. I found that without the wire mock up, my success rate was 50% for an exact fit and placement. Wanting a more perfect set-up and installation, I quickly realized that a formed pattern would make the job easier. After employing the mock up, every single brake line fit perfectly the first time when it came to installing them. Start off with wire slightly larger in length then you think that will be required for your brake line pattern or mock up. The wire does come on a roll and will need to be straightened before you start. You can straighten the wire in the bench vise or just use a ball peen hammer on a steel table. I used both to straighten the wire. This only took a couple of minutes to complete. If you can’t find this type of wire, why not use an old metal coat hanger, or for short brake lines, or even welding filler rod? Start at the receiving end of the first brake line fitting on the car. For example the end of the rubber hose from the brake caliper to the frame, I inserted the wire into the tube opening. Be very careful to only insert it far enough to simulate the actual brake line connection. A socket was selected from the tool chest having the same diameter as my tube bending tool. I found the using a socket as a bending form for the wire was easy to handle while underneath the car. Depending on how long the brake tube needs to be, I might even use a few spring loaded clamps to hold the wire in place on the frame of the car during the forming process. Once I am completely satisfied that the brake line shape is a desired one, I remove the clamps if any were used and measure the length of the wire. I add 0.25 inches (1/4”) times two for the flare on each end of the tubing. Remember, measure twice and cut once. On some tubing I only needed to add the extra for one new bubble flare (0.25 inch) as I was shortening a pre-made brake line. Some time ago, I purchase for about $25 an inexpensive double flaring tool kit. This was by no means a great kit. As with most things that come in off shore, the quality was not great but good enough for the job I required it to do. The kit did have a small tubing cutter. Using the tubing cutter from the kit, I cut the tube to the correct size. In order to make the task a bit easier, I purchased pre-made lengths of tubing with metric ISO bubble flares and new fittings from NAPA. Using tubing from a 25 foot coil took a bit of time to strengthen and I still needed to purchase new fittings. That was fine, but I found that the already straight lengths with new fittings from NAPA saved time. Once the tube has been cut to size, the cut opening should be de-burred. You can use the de-burring tool that comes with most kits, but I found using the wire wheel on the grinder worked just as well and was less frustrating to use. Using the wire form, I now carefully re-create the bends using a hand held tube bender. I use a special set of vise grips that I modified to have a wider flat gripping surface to clamp the tubing to the bender. 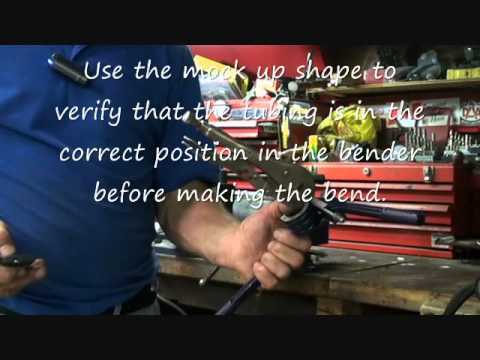 This is especially important for smaller brake lines that do not have much to hold onto while completing the bend. Using the clamp prevents the tubing from moving during the bending process. Before making your last bend on the tubing, install the new brake line fitting correctly making sure it can move into place once the bend is complete. Brake line fittings will not move around or slide over bends. This is a difficult process to explain, and watching the video below should clear up any questions you might have.